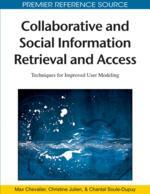 The authors of this chapter present a two-fold approach for adapting content information delivered to a group of mobile users. This approach is based on a filtering process which considers both the user’s current context and her/his preferences for this context. The authors propose an object-based context representation, which takes into account the user’s physical and collaborative contexts, including elements related to collaboration tasks and group work in which the user is involved. They define the notion of preference for an individual or a group of people that develops a collaborative task and give a typology of preferences before proposing a formalism to represent them. This representation is exploited by a context matching algorithm in order to select only user preferences which can be applied according to the context of use. This chapter also presents the framework PUMAS which adopts a Multi-Agent System approach to support our propositions. Nowadays, through the Web or wireless networks, Mobile Devices (MD), such as cellular phones, PDA, etc., can be used, to access distant Information Systems (IS), which allows mobile users to share and to collaborate with communities of users anytime, anywhere. This freedom of keeping connected and keeping the contact with the colleagues in any situations represents an opportunity for collaborating groups. Users are not anymore constrained to work isolated at their offices; they can work and interact with other users at different places and in unpredictable situations. For instance, a user can keep collaborating and use a wiki system to write a document with her/his colleagues even when she/he (or her/his colleagues) is traveling, may prepare a meeting with these colleagues being kilometers far away from the meeting place, share her/his impressions about a photo with her/his friends, etc. All these opportunities to collaborate are rendered possible through new mobile technologies. However, mobile technologies present several physical and technical constraints, such as a limited battery lifetime and display size, for common used MD, and intermittent and poor quality connections, for wireless networks. In addition to these constraints, mobile users are often confronted to environmental constraints, like noisy and uncomfortable environments. Moreover, mobile users typically use these MD in brief time intervals, in order to perform activities and to consult small, but relevant, amount of information. All these constraints significantly affect mobile user’s expectations regarding the content supplied by IS. This content should, for instance, match the capacities of the client device and the quality of the network connection used by the user. If this content corresponds to a video, it should use a format that is accepted by the client device and a quality acceptable for a network transmission. And even if these conditions are satisfied, the video should match the environmental conditions (e.g., no sound if the user is in a noisy environment) and social aspects of the current situation, having, for example, a duration that matches the user’s current activity. Indeed, mobile user’s interests and needs change according to the user’s activities. The supplied content should match these interests in order to satisfy the users and help them in their own activities and when they are working (collaborating) with other users. Through the example presented above, one can note that mobile users have multiple needs regarding content adaptation. More than traditional users, mobiles users need an informational content that suits her/his current context of use, which provides in particular a description of the (changing) conditions (temporal, spatial, hardware, physical and environmental) under which a user accesses one or several IS. In the remainder of this chapter we use “context” and “user’s context” like synonyms of “context of use”. In this chapter, we propose to study how a collaborative and social technology such as Multi-Agent System (MAS) can be used for adapting services and information supplied to mobile users belonging to a social community of people. Adaptation is performed according to the user’s profile (essentially here her/his preferences in terms of activity, content, and presentation) and according to the contexts (environmental but also collaborative) in which she/he uses the system. We aim at providing mobile users who access an IS through a MD with the most relevant information according to the characteristics of the context of use. In a previous work (Carrillo-Ramos et al., 2006), we have defined PUMAS (acronym of Peer Ubiquitous Multi-Agent System), a framework for retrieving information distributed among several IS and/or accessed through different types of MD. The architecture of PUMAS relies on four MAS (a Connection MAS, a Communication MAS, an Information MAS and an Adaptation MAS), each one encompassing several ubiquitous software agents which collaborate in order to achieve the different tasks handled by PUMAS (e.g., MD connection/disconnection, information storage and retrieval, content and presentation adaptation, etc.). Beyond the management of accesses to IS through MD, PUMAS is also in charge of performing an adaptation process over information.